Introduced in the spring of 2009, the Citroen C3 Picasso edged the outgoing Xsara Picasso into the history books and proved that this French firm had its finger firmly on the pulse of modern family motoring. Available with 1.4 and 1.6-litre petrol engines, or a 1.6-litre diesel, the C3 Picasso saw strong reviews as well as securing good sales. 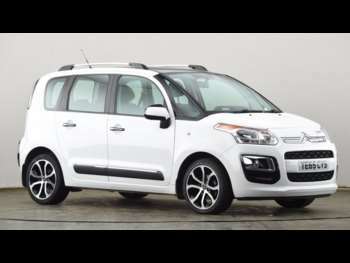 The C3 Picasso is now in its second generation, introduced at the end of 2012, which means that there are plenty of pre-facelift versions on the used market to satisfy buyers' needs. While the Citroen C3 Picasso is undoubtedly a small car, it doesn't let its dimensions hamper its practicality. A long, roomy cabin accommodates five adults with ease and swallows up families and their belongings with no problems at all. The rear row of seats is split in two, with each half mounted independently so that you can slide them backwards or forwards as appropriate. That means you can get additional legroom in the rear and also increase the luggage capacity at the same time. As well as a wealth of compartments and cubbies arrayed around the cabin, you'll find the two-stage boot floor, which can be adjusted to suit just how much stuff you need to carry. While the C3 Picasso isn't exactly built to give petrol heads the kind of driving experience they crave, it does offer everyone onboard a pleasant ride that is made all the more relaxing thanks to the amount of space you have on tap. There's plenty of glass throughout the interior, letting lots of light inside and giving you a good view of the road ahead. This, in combination with the impressive turning circle, makes a used Citroen C3 Picasso a good car for urban driving because you can manoeuvre it easily and park without getting flustered. Meanwhile, the suspension may not make it great in the corners, but does help soak up all of the bumps and potholes that you'll likely encounter on city streets.